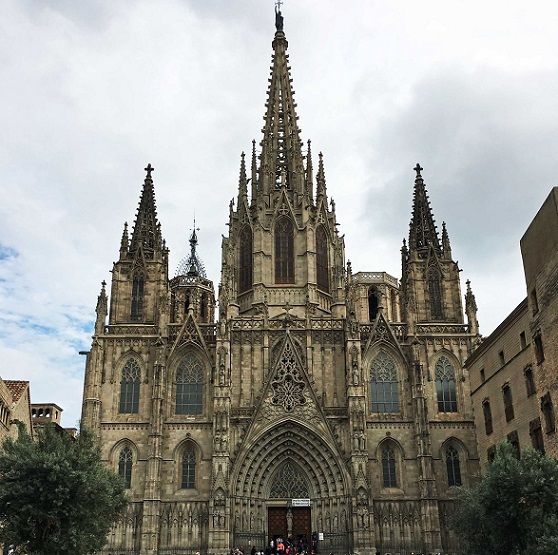 If you enjoyed Paul Scopel’s first Barcelona travel article, then you are sure to love his Barcelona, the Bold – Part dos. The adventure continues. This exciting adventure is sponsored by Mary’s Travel Desk. Enjoy a full service experience with a few personal touches included. Don’t let the world pass you by. Contact Mary’s Travel Desk today and plan your next get away! Hello everyone, it’s Paul Scopel again! In this edition, we continue our exciting exploration of Barcelona and resume touring the awesome capital of Spain’s state Catalunya. 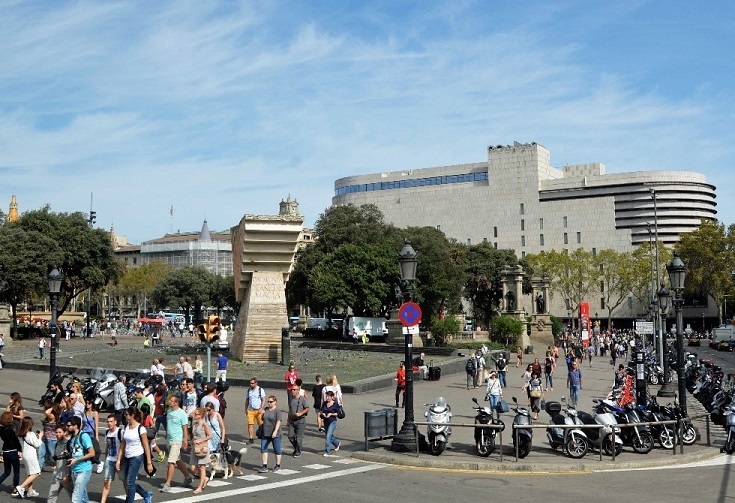 In my previous article, Barcelona, the Bold – Part one, I covered the area north of the center of Barcelona – Placa de Catalunya (pictured left). Lets now make a 180 degree turn and head to the southwest corner of this massive central park. 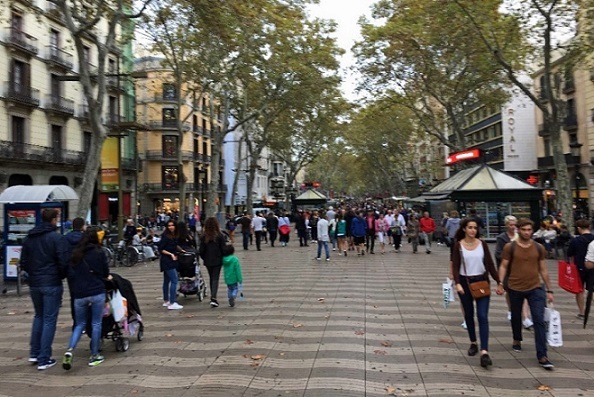 Here we find Ramblas, a long tree lined pedestrian friendly street (pictured right). It is teeming with tourists, cafes, souvenir shops, and pickpockets. I recommend you wear your money belt! Authors Note; This wide Ramblas street is not the same as La Rambla de Catalunya that I mentioned in my previous article. My mission with Ramblas is to first find the city market – La Boqueria (pictured left). 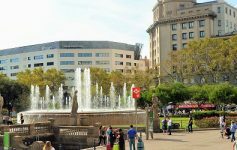 There are a variety of restaurants along Ramblas. However, it’s best to avoid them as the locals consider it to be a tourist trap. Instead, head to the cafes within the market for a more authentic and economical way to sample the dishes. La Boqueria is about half way down Ramblas and more towards the harbor – about 8 or 9 city blocks. 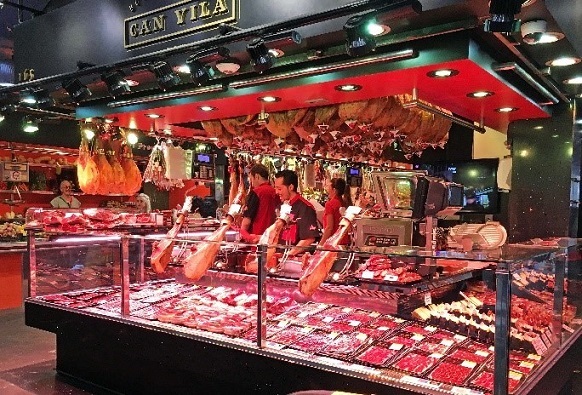 In La Boqueria you can enjoy fabulous Tapas, or delicious Bayonne or Jambon de Bayonne (ham), fresh fish, meats and other treats all in tempting displays (pictured right). In addition to market stalls, the perimeter of the market contains more local and diverse restaurants for a perfect casual lunch! 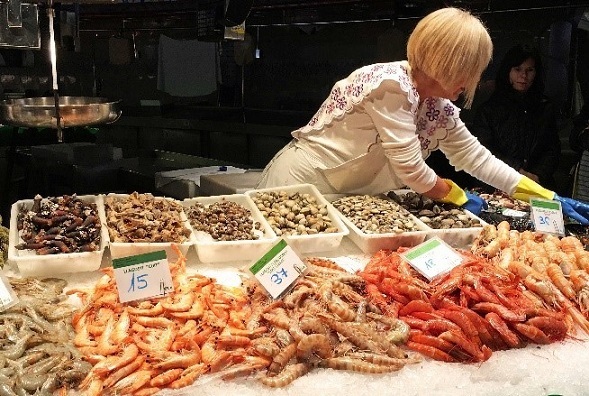 With most of Spain surrounded by water, there is an abundance of fresh seafood (pictured left). 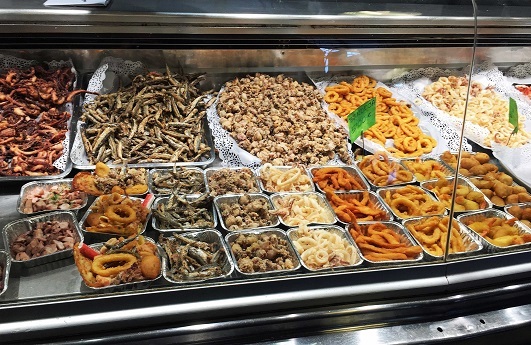 In the La Boqueria market you can choose to buy your main course and prepare it yourself, or already cooked for a quick and easy meal (pictured above left and right). The delicious hams of Spain, especially made from black pigs that are fed only acorns is a must try. The delicatessen ham has great flavor and is very tender (pictured right). Within the market itself are tables and chairs where you can comfortably enjoy lunch, a favorite beverage and/or a special treat. 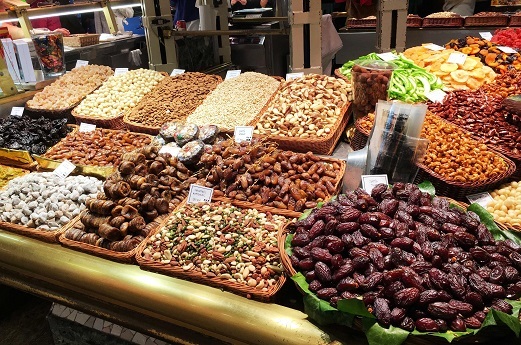 The market also features treats such as fruits, nuts and a variety of Spanish candy. I can’t forget to mention the smoothie and juice bars. I found for my wife her favorite treat – chocolate covered orange peel! After exiting the market, my next goal is a detour off Ramblas through the Barcelona Barri Gòtic – a.k.a. Gothic quarter of Barcelona and the Old City. 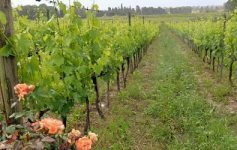 It is in this historic section that ancient Rome constructed city walls that still stand today. 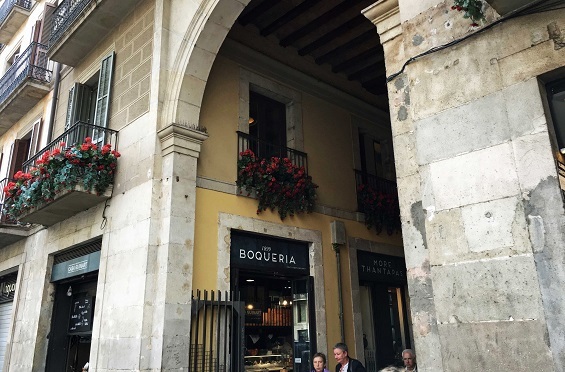 This area is worthy of spending an afternoon to meander among the curving streets and medieval structures. 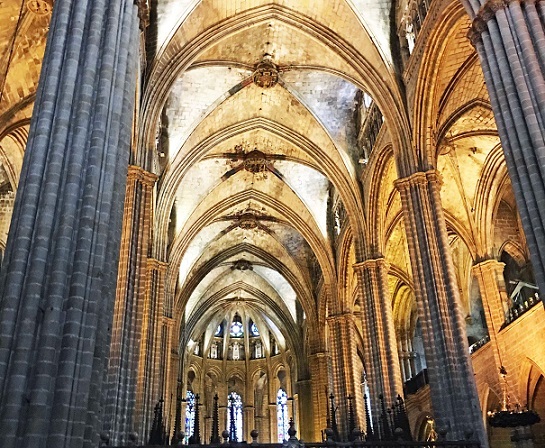 In the center of it all is the majestic and towering Cathedral of Barcelona. A church has stood on this site since the early days of the Christian faith. The first bishop was placed here in 343 A.D. 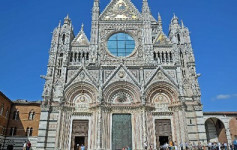 The existing Gothic cathedral was begun in the 13th century and for the most part completed by 1460. It was a relatively new church when Columbus returned to Barcelona in 1493. The tower and ornate exterior were added in the 19th century. I lingered around for an hour to take photos, watch the crowds, and enjoy the lively ambiance and music of the buskers – street performers. Panpipes filled the area with a haunting rendition of Evita’s “Don’t cry for me Argentina”. It was very magical! On either side of the massive nave – central area, are many ornate chapels and altars. The massive arches will evoke a gasp from you as you gape upward. In the cathedral’s crypt under the main altar are housed the relics of a thirteen year old martyr Saint Eulalia – the patron saint of this church. During the reign of Diocletian, Eulalia underwent severe persecution and personal atrocities prior to her untimely decapitation for not recanting her Christian faith. 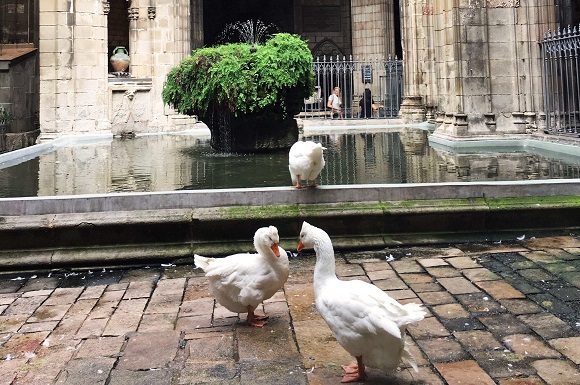 In the adjoining cloisters of the cathedral is a serene garden area in Eulalia’s memory. The garden always contains 13 “watchdog” geese that sound the alarm to the monks should an intruder violate the garden’s interior. Why 13? In honor of her age and the number of persecutions by the Romans that Eulalia encountered. Catalans pride is evident in the ever present Spanish Sardana dances. They randomly occur in front of the cathedral. Hands outstretched to the sky, the participants, as well as tourists, gracefully espouse the patriotic pride of the region. If you have time, the Picasso Museum and other interesting landmarks are within blocks of the cathedral. However, I chose to chill at the beach instead. I returned from my detour and continued down Ramblas to its end at the harbor, or Port Vell. Standing in front of me is a pillar topped with Christopher Columbus (pictured left). King Ferdinand and Queen Isabella greeted the triumphant Christopher Columbus at this spot in 1493 following his first voyage to the New World. 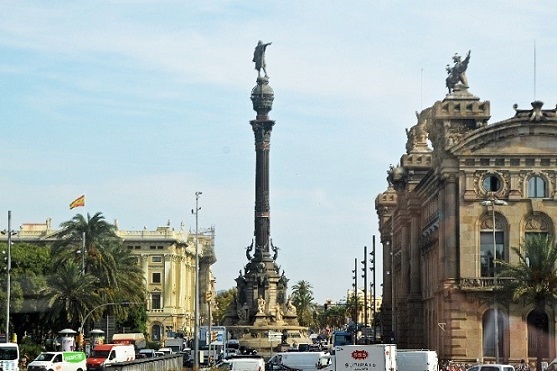 Almost 400 years later during the 1888 Exposition, Barcelona honored Columbus with a statue. The artist Frank Gehry’s “Fish” sculpture (pictured right) is the centerpiece of the Olympic village apartments, which housed 13,000 athletes in the 1992 Games. From the “Fish” and following along the beach is an enjoyable boardwalk. It features parks, cafes, and even sand sculptured castles with plenty of special effects. 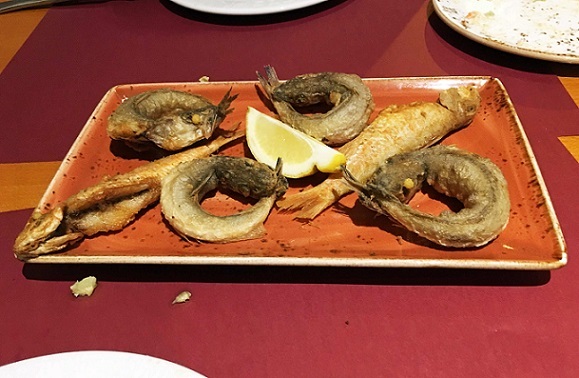 In the Barceloneta district we found our favorite restaurant, “Pescadores”. 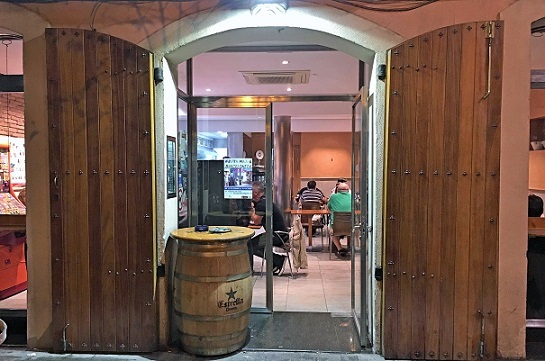 We asked the hospitable husband and wife proprietors for their recommended sampling of Tapas. Wave after wave of delicious seafood flooded our table including sautéed tender mullet, fish balls, crispy huge shrimp, fresh cooked anchovies (pictured upper – left), stewed mussels (pictured right), egg and hash brown omelet, and the pervasive national dessert of flan or caramel cream. While we enjoyed great food all week, my daughter and I pronounced this feast as the best meal yet. 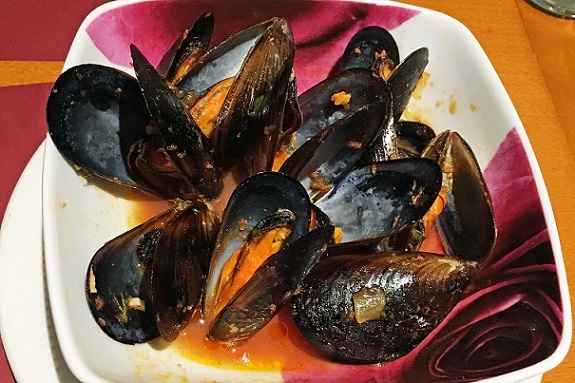 Pescadores is the real deal with very reasonably prices. I ‘highly’ recommend them if ever in the area. They have a simple storefront (Pictured left), but full of seafood treasures inside! 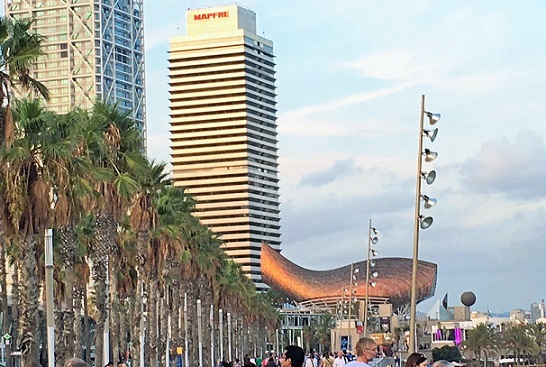 In Barcelona, there is so much to see and do. 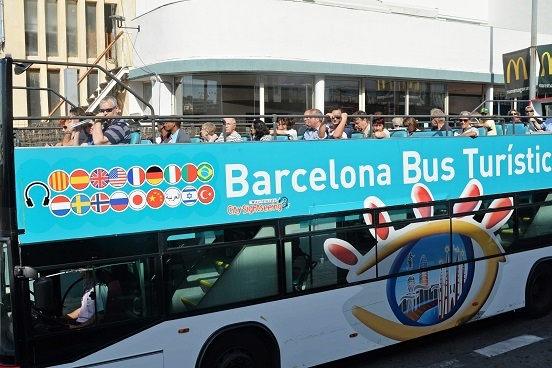 To save hardship on your feet and get a quick overview of the city, I recommend to first tour the city on the double decker bus (pictured below – left) which is operated by the city. 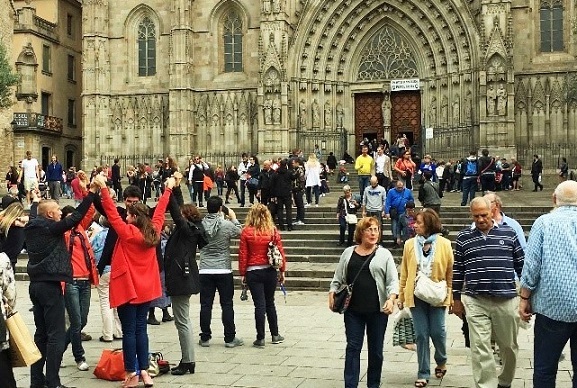 There are two tour routes covering north and south Barcelona. They provide easy hop-off, hop-on access and transfers. Another option is to ride Barcelona’s efficient subway system. Purchasing tickets using the kiosks in the subway is simple. I wish I had tried this option earlier in my journey to eliminate some callouses on my feet! Last but not least, taxis are in abundance with well placed stands in and around the city. The taxi ride to downtown from the airport is approximately 25 Euros, which is more reasonable than most European capitals. I was delighted with my six day stay in Barcelona. While it has always been on my bucket list, Barcelona has now risen close to the top of my favorite places to visit. Why you ask? The beautiful artwork, architecturalstyle, lovely people, and interesting foods to just mention a few of the reasons why. 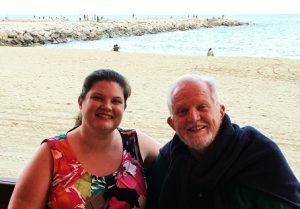 My daughter and I will spend a day at the beach enjoying the wonderful weather before heading back to the states. Previous Article Hanagae Beach on Muuido Island!